Why Pay When You Can Get FREE BUDGETING TOOLS AND LISTS HERE? You made the right choice subscribing to Canadian Budget Binder where we offer you lots of freebies to help get you back on track with your budget including free printable forms for your Budget Binder and our exclusive CBB Budget. Welcome to the gang friends! Below are all products and services we have or currently use and recommend to all of you so I hope you get an opportunity to reach out and explore them. Note: Before you download and use any items on this page or associated with Canadian Budget Binder found on the internet please read our site disclaimer/policy terms and conditions. You may see Google advertisements on this page for budgets those are not my free budget downloads however feel free to explore them. Scroll down to Canadian Budget Binder Spreadsheet 2019 to find my FREE download links. If you love being on the computer why not earn money while you’re doing what you enjoy. Earn cash for taking surveys, shopping online, watching videos and playing games without any sweat. You can’t earn cash any easier and it will help add money to your savings so you can free up the debt you’re working to get rid of or help increase your money power. It’s a WIN WIN… Sign up for Swagbucks Today…It’s FREE, we have it and LOVE it. If you love to earn extra cash Sign up for Survey Junkie. You earn Points for taking Surveys and earn gift cards for your time. Find more links to Canadian Coupons: Where to find Canadian Coupons? Swagbucks…Earn while you shop online, take surveys and more in Canada! Free Sign-up, no gimmicks. Earn Extra Cash when you shop online. Sign up with EBATES Canada and receive money back when you shop! We LOVE it! Don’t miss the savings by signing up for Checkout51 and other Coupon Apps. Honey Honey is a browser extension that automatically finds and applies coupon codes at checkout with a single click. My Points All payouts are made through gift cards to Amazon or other leading retail companies. FREE Handy Tools Just Click, Save, Open and Print! Download your FREE 2019 BUDGET SPREADSHEET NOW! Above is a screen shot of our Canadian Budget Binder Budget Spreadsheet. You will need to know how to use excel and have the spreadsheet program on your computer or mobile phone. Below are the reviewed 2019 versions of the free budget spreadsheet. Please read all disclaimers before using any information, budgets or downloadable tools from this site. By downloading and using any or all free tools or lists created by Canadian Budget Binder you verify that you have read and agreed to the disclaimer and use at your own risk. Budget #1– You can use the pre-existing budget categories or you can use your own if you wish and you have the option to use projected expenses or not. Please read the notes I left around the budget for Quick Tips by holding your cursor in each cell. Budget #2-Everything is pre-set so you have to use the pre-defined budget categories but this budget will generate year-end budget figures where the other one won’t but you must use the categories already in this budget. If you change anything you will mess up the formulas and year-end figures. If you want to customize then you need to use Budget #1 but you won’t get year-end reports unless you create the charts yourself or use Budget #2 where it is all built for you. All formulas are open so use with caution because if you break a formula then your numbers won’t add up. If you are not sure what projected expenses are read Step 10 in our budgeting series below. I suggest for budget beginners to fill out the basic budget to get an understanding of where you are with your finances. Whether you chose to use budgeting jars or an envelope tracking system or manage your money other ways this is a great beginners budgeting tool. 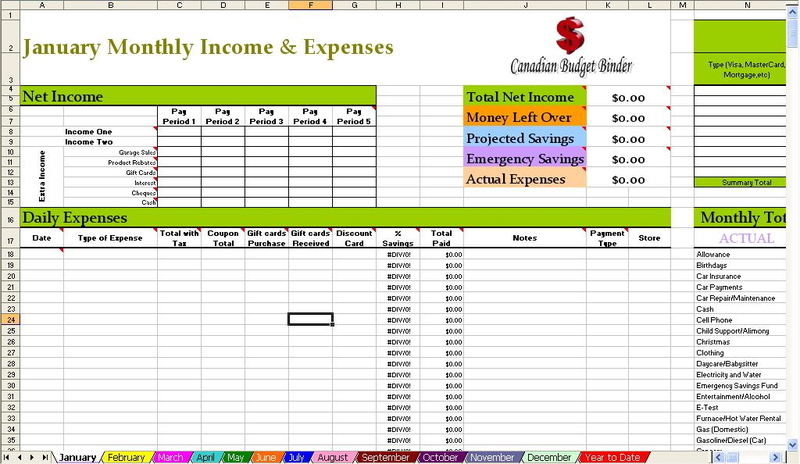 This sheet is a basic budget sheet which you can print or alter on-line as you need. You can also use it as a budget guideline or post it in a file folder, budget binder or on your refrigerator for reference. Below is our mini 10 step budgeting series that you can click and read. Budgeting for Beginners from A to Z is a good read if you are new to budgeting as well. Lists are a great way to keep your life organized so you can easily refer to information when you need it. We use these lists in our own home and which helped us become debt free and pay our mortgage off in full over the course of 5 years. Fill your Budget Binder with these free printable forms and start organizing and saving your way towards Debt Freedom. Refrigerator-Cleaning-Chart– Keeping your refrigerator clean takes more than a box of baking soda. Hang this handy cleaning chart on the side of the refrigerator, in a binder or peg it to your cork board. Chart the date the refrigerator was cleaned, what was cleaned and who cleaned it. The Handy To-Do List– Never get caught forgetting to get something done. Create a to-do list so you have all the chores you need to complete written on one simple list. Freezer Inventory List- Canadian Budget Binder– Keep track of what’s in your freezer with this freezer inventory list. You can laminate it and you can also add and delete items in each list to suit your lifestyle. Canadian Budget Binder Pantry List– Print this Popular Handy list and post it in your pantry cupboard, room, or in a folder for easy reference. You can type in your staple pantry items, how many you have and the expiry. That takes the guess-work out of wondering if you have certain items in your cupboard. It also helps save money by not duplicating a purchase. Weekly Menu Plan Shopping List and Grocery List– The Ultimate All-in-one list for the super meal and budget planner in you. Print each page and put them in your coupon binder, budget binder or on the refrigerator for easy access. Canadian Budget Binder Shopping Needs List– The Shopping Needs List is a list you can pin to your refrigerator and every time you run out of something in the kitchen, pencil it in! When you do your flyer/coupon match-ups it’s easy to see what you need in your kitchen. If you don’t do Coupon/Flyer Match-ups you can simply bring your list along with you grocery shopping. Common Spices Kitchen Check-list PDF – Use this list to inventory your spices and to stock up on basic spices. Price Comparison Grocery List– Use this basic list to document the regular prices of your favourite products at different grocery stores in your city. This will help you to get to know the best prices and will also help you to save money in the budget. Printable Weekly Menu Plan -Canadian Budget Binder– You can now print our weekly meal plan schedule. We use this to plan our meals to help cut back on extra expenses. When you print there will be 4 copies for a typical. If you want to print only 1 adjust your printer to print only page 1. Weekly Menu Plan and Grocery List Free– You can now meal plan and plan your grocery shopping all in one list. Net worth Calculator (Canadian Budget Binder)– This is a calculator I designed to easily calculate our Net Worth each month. Go ahead and try it out if you like. I also have a Sample Mr CBB’s Net Worth Calculator sample. Monthly Over-Time Tracking Mr.CBB– This is a sheet you can track your work’s overtime and weekly hours in excel. You can also print it to put on your refrigerator, in your locker, desk, binder, purse, wallet or wherever it is you want to keep it. You should always keep record of your work hours. Garage Sale Route List Canadian Budget Binder– This handy garage sale route list is perfect for any savvy garage sale enthusiast who wants to get there fast. Home Inventory List– Creating an inventory list where you can documents contents of your home of value room by room with this handy home inventory checklist is easier than you thought. You can print the list and file it in a fire safe box or in a safe place in case of fire and theft. This personal property list will be easier to hand over to your insurance company in the event of a claim. Tracking Sheet: Coupon, Freebies, Trades, Trains and Rebates– Track your coupons and rebates with this tracking list from Coupon Christine. Furnace Filter Replacement Chart– Download this filter replacement chart so you can post it near your furnace for easy reference. You can then write in when you last changed your filter each month of the year. Product Price Adjustment Tracking List– Take note of those big-ticket items that you buy and when you bought them so you can watch the prices. If the store offers a product price adjustment you may be eligible to claim some cash back. Home Buying Wish list/Checklist- Coming Soon! Roommate Cleaning Schedule- Coming Soon! Sample Roommate House Rules Agreement- Coming Soon! Our Keto Diet Pantry List – You can also download our 30 keto diet staples list printable and put it on your refrigerator for reference and motivation. You can download a free printable of THE ULTIMATE PANTRY ESSENTIALS FOR FALL RECIPES for review and to take along with you when you grocery shop. Here you will find sample letters that I have written and that you can use and edit to suit your personal needs! Sample Letter Rent Negotiation Pdf. Credit Card Comparison Widget For Canadians – Compare the Best Canadian credit cards before you apply. OSAP: Ontario Student Assistance Program: Find out if you qualify for Free Tuition or other Grants with the new online OSAP calculator. Check out this new stock directory from Modest Money. It’s a great resource to research stocks to buy or to keep up with those already in your portfolio. Home Renovation Checklist– This is a free Remodel-Planning-Checklist created by the people over at SweetRemodel.com. Swing by and check out all the amazing free remodeling tools they have to help you with your remodel. Order or Print your favourite money-saving coupons in Canada and enjoy the savings. Finance Tools and Resources over at Money Mini Blog are a smart investment. Simply Stacie has even more free downloads and printable lists that might interest you. Trans Union Canada is another great source for finding your credit score and getting your credit report. Note: Before you download and use any items on this page or associated with this site found on the internet please read our site disclaimer/policy terms and conditions. I’d love it if you created an app to use the budget on the go. Right now, do you have an app you would recommend? What seems to be the problem downloading the files? I’ve just tried without issue on boy my wife’s mobile phone and the laptop. You can also email me http://www.canadianbudgetbinder@yahoo.ca you must have excel on your computer or phone to download the file. Look, don’t get me wrong, I really appreciate you having free budget tools available. I think it’s terrific!! But why or how could you possibly do a budget spreadsheet without an expense category for “restaurants” or “dining out” ?? I went up and down the list 5 times in disbelief … but nope, it’s not there! I was hoping to use the 2nd spreadsheet with yearly totals and graphs but now it looks like I’ll need to default to spreadsheet #1. Thanks for your comment. Since this was originally our personal budget eating out falls under “Entertainment”. With the first budget you have the ability to alter the category tabs as you see fit provided you understand the basics of excel and formulas. So go for it!!! 🙂 Thanks for stopping by. Whoa – that one got away on me. I’ve uploaded the budget spreadsheet and have input all of my January 2018 details. I’ve been using a simplified excel spreadsheet that a friend built for me, to track expenses for about 4 years and there was a budget component, but something wasn’t working right. So far I like how your design works. Super basic question for you – how long do you keep receipts for? Keep receipts for warranty or return purposes for purchases you make for the duration needed. Other than that if you want to review receipts every few months looking for trends etc keep them. Otherwise once you’re done with them you don’t necessarily need to hang on to them. I live in California, will these work for me? I’m sure they will. Which were you thinking of downloading? The budgets are fine to use as are any of the lists as they are aren’t country specific. Anything outside of CBB I’m not sure. I’ve just downloaded your budget template for excel and have a question. How do I modify the categories for the drop down list? I’ve modified them in the two columns (actual etc) but can’t get the drop down list to change…….maybe it’s because it’s late and I can’t see it….thanks in advance! found it!!!! thank you so much!!! i always have a list and i always eat at home before shopping.